The weather is looking fine for the last roller bike parade of the season this evening (Friday). Skaters and cyclists are welcome to mark the last date of 2015 by speeding through the tunnels of the city centre. Meet at Place Poelaert from 19.00 for a departure at 20.00. Alternatively, re-live your students days at music event Nocturne de l’ULB this evening from 18.30. The 11th edition of the Brussels Free University non-profit evening welcomes electro, rock, world and urban musicians for a night of live concerts, plus a competition for emerging artists. At Campus Solbosch, entrance via Avenue A Depage, until 3.30 Sunday morning. There’s more live music on Friday and Saturday night in celebration of the Wallonia-Brussels Federation’s annual holiday on Sunday. The free programme in the Grand‘Place features a francophone line-up tonight (including Zazie, Thomas Dutronc, Jali, Marie Warnant, Saule, Raphael) and a Belgian one on Saturday (Kid Noize, Nicolas Testa and La Smala). From 20.45 to 22.00. There’s fun for all the family at the Fêtes Romanes at Wolubilis this weekend (pictured). The cultural centre of Woluwe-Saint-Lambert stages the street art festival every autumn. 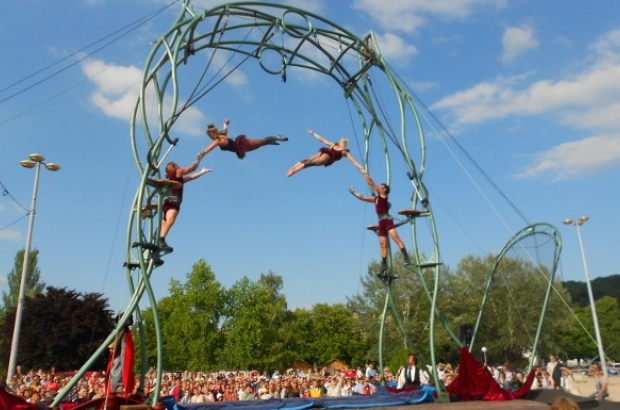 The 2015 edition has ten stages welcoming around 50 shows, varying from acrobatic and aerial circus, street theatre performances, urban dance, storytelling, object theatre and music. There are also workshops for all ages, an exhibition of new work from Artothèque and a rendezvous for contemporary artists. The Midi area of Brussels boasts an eye-catching new attraction. The 60-metre high Paris big wheel was inaugurated in Rue du Midi on Thursday in the presence of Brussels mayor Yvan Mayeur. It will attract visitors to the area until 22 November before moving to Ghent. Previously located in Place de la Concorde in Paris, the 55 metre diameter wheel boasts 42 cabins and a total capacity of 252 people. In comparison, the Midi Fair wheel measures 44 metres in height and the Winter Wonders wheel 50 metres. The latter will again be accessible from 27 November as part of the city’s 2015 Christmas festivities. Meanwhile, the Parisian square will soon be welcoming a new 70m high wheel. If you’re thinking about taking the leap and buying real estate in Belgium, pop into Homexpo this weekend, the first fair of its kind in the country. Until Sunday, the salon at Tour & Taxis brings together all sectors of the residential property market. The aim is to provide the general public with information and advice on all aspects of buying a home. Free entrance. Last tickets are on sale for extrovert British comic Eddie Izzard appearing at Uccle Cultural Centre on Friday 2 October. Continuing his international Force Majeure tour, the actor comedian shows he’s a tour de force himself by performing his set in French. Izzard is on a personal mission to prove that humour is universal by undertaking stand-up comedy in French, German and Spanish, with Russian and Arabic apparently next on his list. While Belgium’s multinational audience is already adept at adapting to English-language comics, this show should be an amusing variant for comedy fans. Tickets from English Comedy Brussels.